Pirates: Rule the Caribbean! is a fun, engaging, and surprisingly addictive Facebook application with a playerbase numbering over 1.6 million. Like the vast majority of Facebook game applications, Pirates is completely free to play, runs in your web browser, and allows you to team up with your friends to take on other "crews" of players to earn rewards. Although fairly simplistic it appeals to people of all ages and backgrounds, whether they consider themselves "gamers" or not. The social aspect of the game combined with the addictive advancement quality has made Pirates a stunning success, and well worth your while. 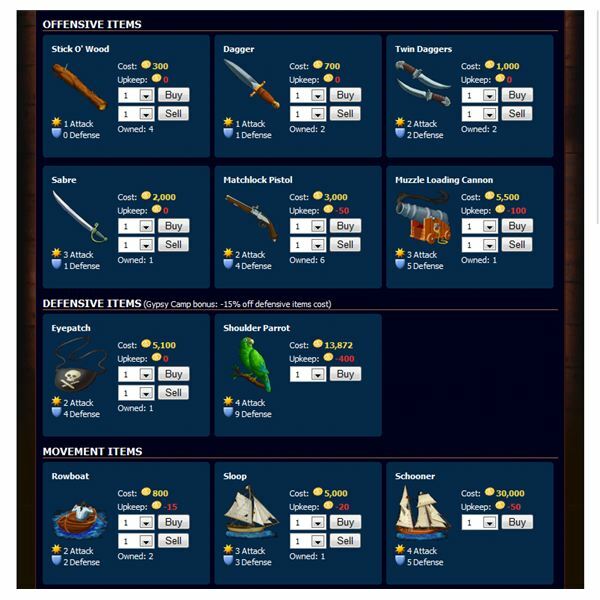 Like many other browser based applications, Pirates isn’t much of a graphical game. Simple cartoon-styled images convey very basic information, like what your boat or island looks like. From a gamers perspective this is often a huge turnoff, but as it turns out you don’t really need to see the action to appreciate the game. Things like battling happen automatically, and the results are determined by your stats and, to some extent, random chance. I’ve seen some browser games that fall flat on their face as far as engaging gameplay, but Pirates manages to be just complex enough to keep people interested, while still remaining "newbie" friendly. It isn’t entirely newbie friendly, however. Without someone to explain it’s liable your first few experiences battling other players are going to be painful. Figuring out how to obtain gold, what items it is best spent on, and just what exactly your island does for you is a learning process. My best advice is to, before doing anything, click on every single category and tab just to find out how to use it. Pirates not only encourages interaction with other players, it all but requires it. This will disappoint the antisocial among us, but then again, they’re not likely to be using Facebook in the first place. From a social aspect my biggest complaint about Pirates is that it encourages spammy behaviors. You start off with no crew, and have to either join the crews of friends already playing the game, or invite your other friends to join in. Since it is very difficult to progress past a certain point without having a fairly extensive crew, this means that a lot of players start to not only spam invites to play, but also spam brag messages about accomplishments they’ve made in the game for the same effect. If none of that bothers you, then Pirates ends up being an enjoyable experience for you and your friends. It doesn’t require deep interaction with them, but you certainly reap benefits from them playing, and can talk about your various experiences. Pirates can seem impossible to put down the first time you play it, but after awhile the grindy gameplay and the lack of immersion eventually cause it to lose its draw for many. The problem lies mainly in the lack of "goals" presented to you in the game. It’s hard to figure out what the ultimate outcome of the game should be. Are you playing to amass an excessive amount of gold? Why? Is your goal to become the top rated player in the world? Is that even feasible? The fact of the matter is that there is only so many times you can click the plunder button, or the fight button, before you tire of it never being any different than the very first time. The gold amount may increase, the items may get better, but the gameplay remains exactly the same. Pirates: Rule the Caribbean will appeal to people who don’t like to get completely involved in games, or who just want to kill 10 or so minutes without feeling the irresistible urge to waste the day continuing. Learning to play only takes a few minutes, and it is something you can do for a short time every day and still see the results of your efforts. Not very many people dislike pirates. They may be barbarians pillaging and destroying everything in their path, but there is a classic draw that has been epicly romanticized in our culture. Everyone wants a piece of the booty. Therefore Pirates has what I call a "cuteness" draw – people want to play simply because they enjoy pirates. Despite the grindy gameplay Pirates gives a sense of accomplishment. Most actions in the game are rewarded in some way. The first 10 or so levels don’t require much time or effort to achieve, and there is usually a random chance for you to obtain a powerful reward from fighting and plundering. 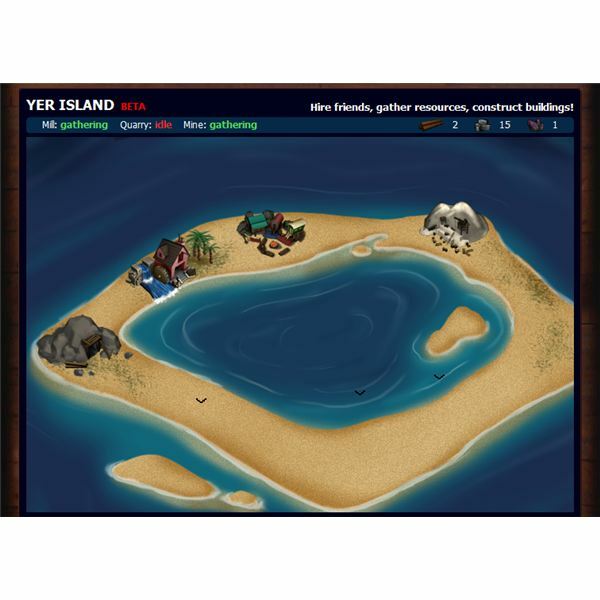 Althrough the islands are very simplistic they offer the player a sense of ownership, ie: "this island is mine and I must keep it functioning". From the first few actions you take until you inevitably decide to put the game down gameplay is exactly the same. Nothing truly new is ever introduced. You plunder until you run out of energy, fight until you run out of strength, then spend your gold on upgrades. An hour or so later you get to rinse and repeat. As previously mentioned, Pirates encourages spammy behavior through "bragging" and invitations. Every time you make the slightest accomplishment in the game, whether it’s leveling up or purchasing an upgrade, you’re given the option to share this minor event with all of your Facebook friends. You are constantly encouraged to drag all of your friends in to play with you, and at times it looks like that is your only choice in order to advance further. The end result is to non-Pirates players, Pirates players are irritating to the core. If you try and enjoy Pirates! there are some other Facebook games you may also enjoy. If you enjoyed the island management part of the game, Farm Town provides a similar sense of ownership as you grow and expand your farm. 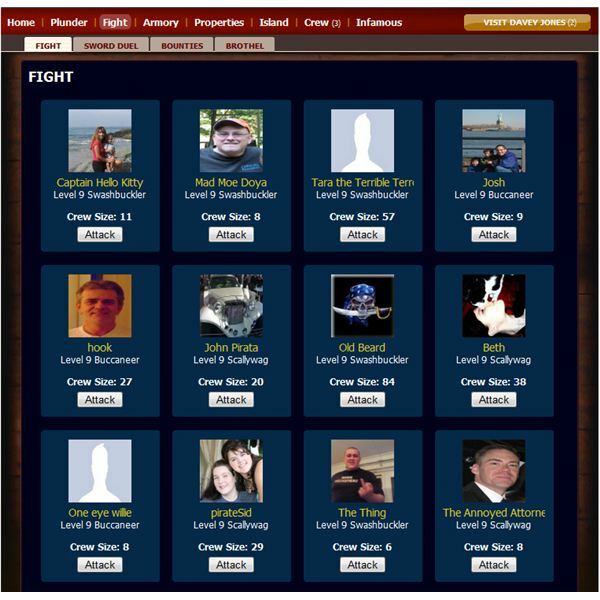 If you preferred the fighting aspect, Mafia Wars might be a game you will get a kick out of. Facebook has a wide variety of multiplayer games that boast millions of players. Keep checking the Facebook section of Bright Hub’s MMO channel for more reviews and guides.